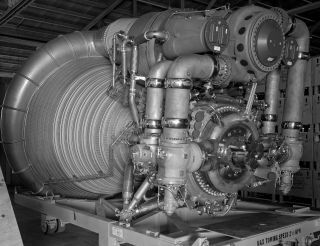 A close-up view of an F-1 engine for the Saturn V rocket’s first stage. Amazon.com CEO Jeff Bezos says he has found the five engines used to launch Apollo 11 and plans to raise at least one from the ocean floor. NASA's chief hopes that Amazon CEO Jeff Bezos has "all the luck in the world" recovering one or more of the engines that launched the first manned moon landing mission from where the dot-com billionaire recently discovered them on the ocean floor. "I would like to thank Jeff Bezos for his communication with NASA informing us of his historic find," said Charles Bolden, NASA Administrator, in a statement issued Friday (March 30). "I salute him and his entire team on this bold venture." Bezos revealed earlier this week that his privately-funded expedition had been successful locating what he believes to be the five massive F-1 engines that powered a Saturn V rocket off the launch pad with Apollo 11 crew members Neil Armstrong, Buzz Aldrin, and Mike Collins aboard. Bezos' expedition used state-of-the-art deep sea sonar to locate the Apollo 11 engines lying 14,000 feet below the surface. He is now planning on attempting to raise one or more so they can be publicly displayed. "We don't know yet what condition these engines might be in — they hit the ocean at high velocity and have been in salt water for more than 40 years," Bezos wrote on his Expeditions website. "On the other hand, they're made of tough stuff, so we'll see." Bezos said that the engine recovery effort will be privately financed, foregoing public funding. Despite his investment, which some salvage experts have said could run into the millions of dollars, he won't be able to keep the fruit of his labor. "NASA does retain ownership of any artifacts recovered," Bolden stated, "and would likely offer one of the Saturn V F-1 engines to the Smithsonian Institution's National Air and Space Museum in Washington." Bezos acknowledged as much in his own announcement but made a request should his team be successful raising more than one engine. "If the Smithsonian declines or if a second [F-1] engine is recovered, we will work to ensure an engine or other artifacts are available for display at the Museum of Flight in Seattle, as Jeff requested in his correspondence with my office," Bolden said. "I have directed our staff to begin work to exercise all appropriate authorities to provide a smooth and expeditious disposition of any flight hardware recovered." The F-1 engines that Bezos hopes to recover remain the most powerful single-nozzle, liquid fueled rocket engine ever developed. Five engines were used as the foundation of the 138-foot (42-meter) tall S-IC, or first stage, of each Saturn V, which depended on the engine cluster for the 7.5 million pounds of thrust needed to lift it off the launch pad. Each F-1 had more thrust than three of the main engines used to launch the space shuttle combined. And at 19 feet (5.8 meters) high and just over 12 feet (3.7 meters) wide, the F-1 remains the largest single-chamber, single-nozzle liquid fuel engine ever flown. A total of 65 F-1 engines were launched and then dropped into the ocean between 1967 and 1973. The five that flew in 1969 on Apollo 11's Saturn V rocket may be the most famous. Bezos, then just 5 years old, was among the millions who watched those five engines ignite, starting mankind on its first journey to walk on another heavenly body. He credits the Apollo 11 mission as being "a big contributor" toward his passions for science, engineering, and exploration. "It sure inspired me, and with this endeavor, maybe we can inspire a few more youth to invent and explore," Bezos said. "All of us at NASA have our fingers crossed for success in his upcoming expedition of exploration and discovery," Bolden said. "All of us at NASA have our fingers crossed for success in his upcoming expedition of exploration and discovery," Bolden said.Follow collectSPACE on Facebook and Twitter @collectSPACE and editor Robert Pearlman @robertpearlman. Copyright 2012 collectSPACE.com. All rights reserved.